Dr. B.R. Ambedkar had donned many a hats in his lifetime. He was an economist, a political scientist, a sociologist, a philosopher, a jurist, a constitutional expert, an activist, a social reformer, a politician and a lot more. In all his roles, his inspiration was always to bring about change in its truest sense, impacting the lives of the most marginalised people that existed. A little foray in one of his seminal works- of which there are many as he was a prolific writer as well- is his speech that could never be delivered, “Annihilation of Caste”. This work is a treatise on the subject of systemic discrimination in Indian society which is based on caste and varna system. The extensive references to examples and works of intellectuals from all over the world as well as the systematic argument that he builds against Brahaminical caste system prevalent in India, make this work one of the most intellectually sound pieces ever written. But at the same time it is Ambedkar’s wit that makes it an excellent read and saves it from being dull and monotonous. Even though Ambedkar had a wealth of knowledge, as evidenced by his citations from great scholarly works, he knew very well that activism cannot afford to be completely esoteric. He was first and foremost a quintessential activist who believed in connecting with the masses. And like any true activist he also knew the importance of communication and media of communication for furthering his message. It is true that many thinkers, activists and reformers of those times engaged with the existing forms of mass media, namely newspapers, journals and magazines. But what separates Ambedkar from others is his ability to recognise the potential of emerging forms of mass media and will to critically engage with them. The clearest example of this attribute is found in his much celebrated speech, “Annihilation…” itself. As one reads this piece, one is pleasantly surprised to find a reference to one such medium, which anyone would hardly expect in a socio-political document written in 1930s. Ambedkar in this speech is making a larger point about how political reforms must always follow and not precede social reforms to have any meaning and substantial impact. As he is referring to some brilliant case studies and arguments, what catches one’s eyes is an unlikely reference to a 1935 devotional biopic by the name of Dharmatama. 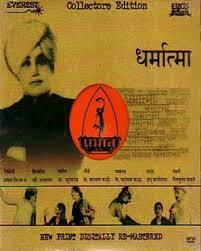 Made by V. Shantaram, Dharmatama is a bilingual (Marathi and Hindi) biopic on the life of Eknath who, according to the film apparently, worked against caste system and untouchability rampant in society. The fact that the narrative of the movie had elements of traditional-conservativism, could not escape the critical scrutiny of Ambedkar. In fact, most movie critics even today, (when the art of storytelling through cinema has come a long way), are either unable or unwilling to see some very obvious subtexts of the narrative in Indian cinema. Moreover the present scenario of dealing with brahminism, caste system and caste discrimination is deplorable not only in cinema story telling but also its critical scrutiny, more so in mainstream media but also in the alternative avenues. Thus Ambedkar’s engagement with the issue of casteism in cinema was one of the trailblazing but sadly rare occurrences. What is also very significant is the engagement of Ambedkar with cinema as a medium itself. In terms of mass communication, in the 1930s, non-fictional mass media included newspapers, journals, articles etc. while fictional forms included only novels and short stories. Story telling through cinema was in its nascent stage. And similarly even the audiences were coming to terms with it. This medium as compared to the printed word is much faster paced and it is easier to miss the finer details or subtexts included in its narrative or at least it would have been in those times when cinema viewing was also a new phenomenon. Thus Ambedkar’s critical scrutiny of the film was an important breakthrough, especially its inclusion in an important socio-political text. This way, not only the importance of cinema as a medium is asserted but also the need to scrutinise cinema in a socio-political context is reinforced. Perhaps some of the readers may find this assertion of significance absurd, since for most of us commenting on a movie in our facebook posts and tweets is a routine phenomenon. But considering that cinema was still a completely new ballgame in India in those times, this engagement is significant. To put this scenario into context, it would be wise to look at another stalwart of those times- M.K.Gandhi. Gandhi was a staunch traditionalist and conservative. He believed strongly in Hindu religion and a society based on varna system. The latter was the biggest point of contention between Ambedkar and him. While Ambedkar was taking cinema as an important medium, critically scrutinising it and including his commentary in his speech, Gandhi did not want to do anything whatsoever with the medium itself. In a truly hysterical fashion Gandhi on more than one occasion described cinema as an “evil”. In an interview with the Indian Cinematograph Committee, he admitted that he has never been to cinema yet argued that “… the evil that it has done and is doing is patent.” In hardly a few decades what great damage might have cinema caused to the society, perhaps only he knew, but his complete refusal to engage with the medium shows how closed minded he was to new ideas. Gandhi resisted change and Ambedkar embraced it. Though Ambedkar was critical of depiction of the central character in the movie Dharmatama, he nevertheless engaged with the medium. 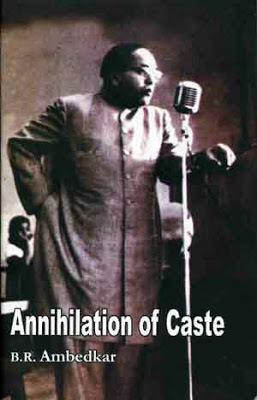 Gandhi and Ambedkar exchanged many responses, back and forth, subsequent to the publication of “Annihilation…”. While reading Ambedkar’s speech, Gandhi must have definitely come across this reference of cinema. Unfortunately he never commented upon it. Had he done so, knowing Ambedkar, Gandhi’s notions about cinema too might have been challenged and substantially critiqued and the discourse on Indian cinema might have had an interesting take to refer to and draw from.